It was a brisk Monday I should say, after a tiring weekend of baking and cake decorating, my bff Sarah Carol decided it was time we went on a lunch date as we have made many lunch dates only to have something come up and is either forgotten or profuse apologetic text messages. So today we decided it was THE DAY! I was really not into eating anything unhealthy, and heavy, and well I am sure by now everyone knows what a pain I am when I go out to eat… it all has to do with Balance. And it is up to the Restaurant to know what Balance I am in, at that moment or the whole lunch thing can be a horrible parody never to be forgotten. Carol wanted vegetables, I wanted vegetables, Rashid well he hadn’t decided at that time so off we went to Yogitree. at the Gardens. I have passed the Yogitree a few times but had never ventured inside as I am always eating with friends who want Chinese or Japanese. So today we were going to eat healthy. Now my version of healthy and Carol’s version of healthy can differ, as I know her well enough and she knows me well enough as well. So we entered Yogitree and there was a crowd already and it was not lunch time yet. Ambiance wise, I should say simplicity is the key, it was bright, happy and no airs like some healthy places I have been to. So we got our menu. Carol Smizing....Tyra would be proud! 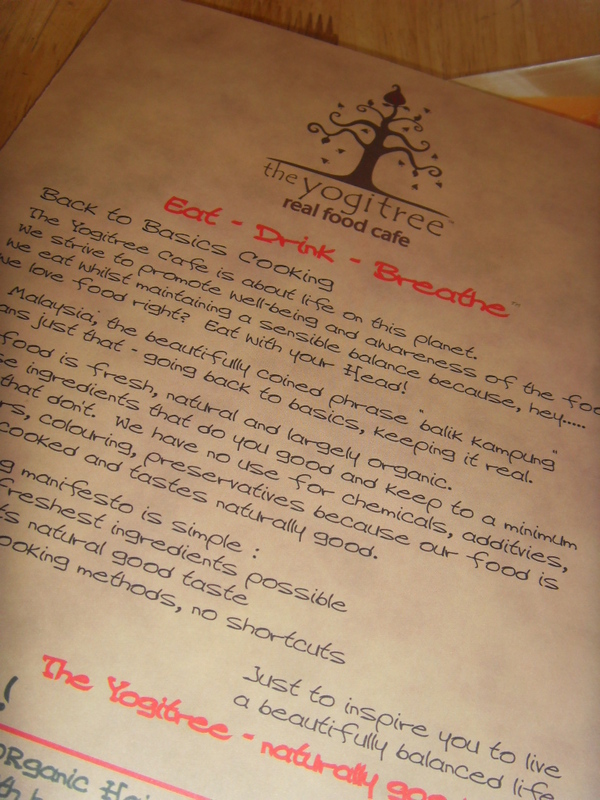 Now don’t get me wrong, I had the impression that Yogitree served healthy food, meaning healthy, no oil, no fat, nothing bad at all. But what I stared at in the menu was your typical everyday foods only made with good, fresh and better quality ingredients. 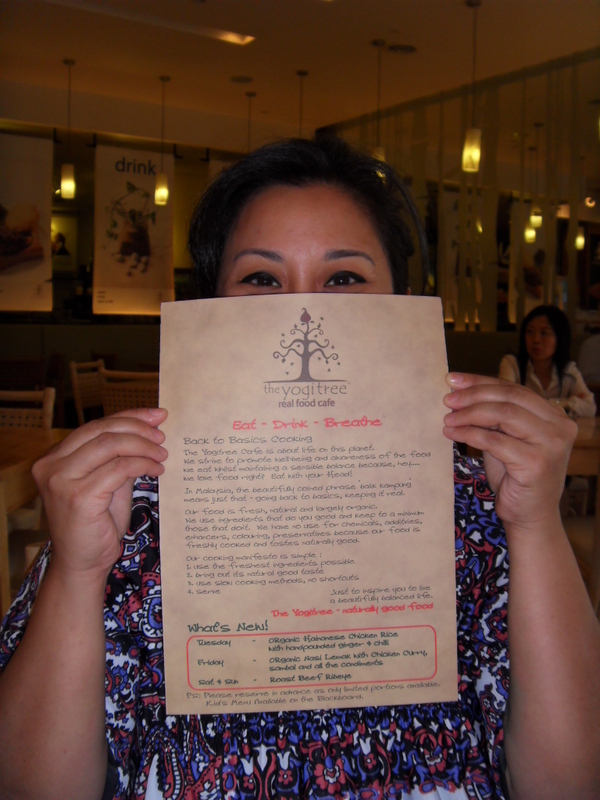 They even had Nasi Lemak which was recommended, because they used brown rice. They even had Organic Hainanese Chicken Rice. Now that I had to taste as I have not had a plateful of chicken rice staring me in the face for a long long time. We’re talking years here. Alas, it was only available on Tuesday. So I ordered a salad, Carol ordered a salad and a pastry case thing with creamy mushrooms, and Rashid orders a steak and chips. We got our homemade lemonade and Rashid had Milkshake, which looked absolutely yummy. Carols Salad appears. 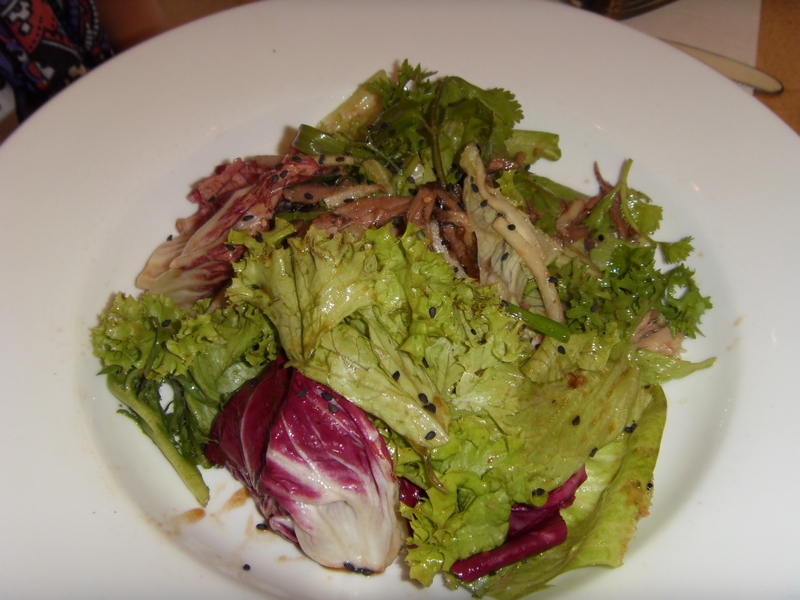 It was a leafy salad with slivers of pear and duck topped with black sesame seeds. Now while the taste was fine, I did find the dressing to be a tad bit too over powering and this made the lettuce leaves looked wilted. 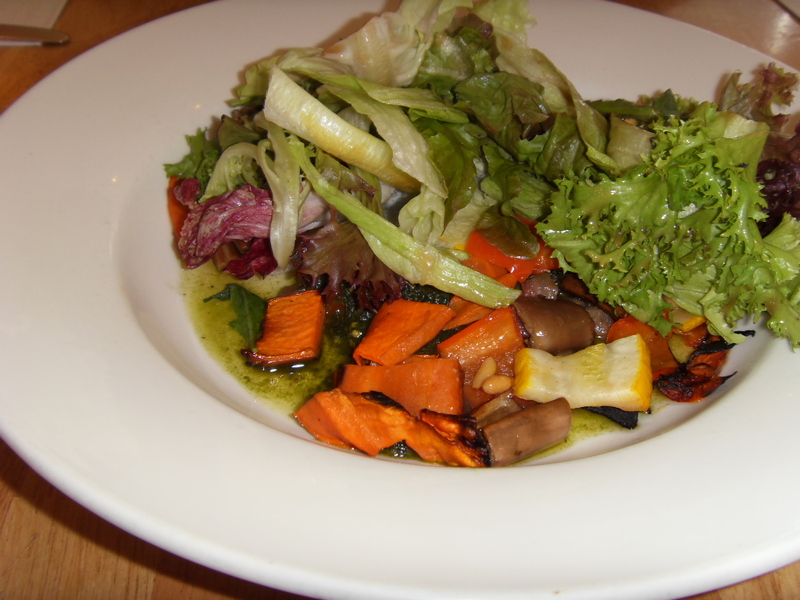 Perhaps a little bit more color would have enhanced the salad that much more. Also the dressing thoroughly killed that ducky flavor, now whether this is good or bad I am not sure. 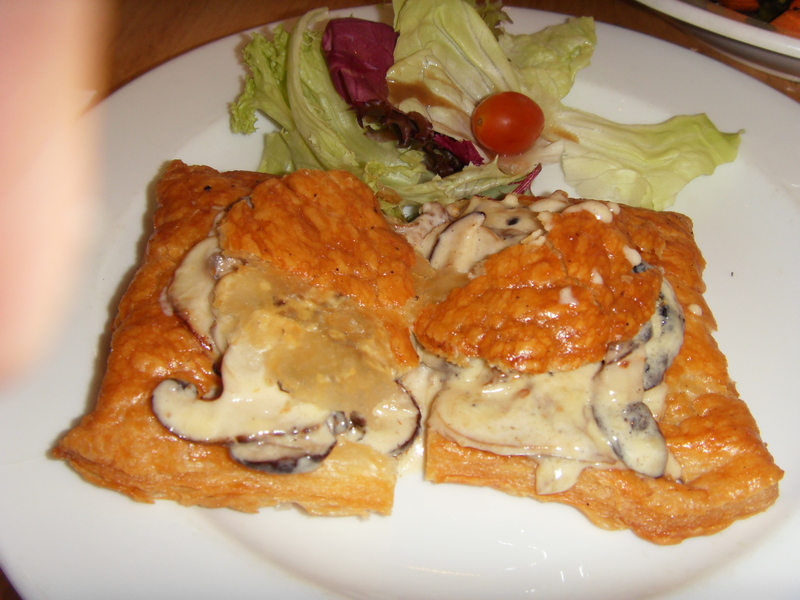 The Pastry parcel arrives and it was something like a large vol au vent, filled to the brim with creamy sauce and button mushrooms. I had half a piece and it was extremely nice and the pastry was freshly baked and so it was piping hot as well. Now this coming from a healthy restaurant was certainly something else as for a fact I know pastry is not healthy at all, and more over puff pastry for that matter. But I loved it nevertheless. I could have had a whole piece but the girth around the stomach made me think better. I’m a pastry junky by the way… will talk big about diets and all, place a plate of anything hot pastry and it will all change. My salad was a roasted vegetable salad. Appearance wise this was eye catching with a myriad colors of vegetables that I like. Again the chef was a little too generous with the dressing, that I felt I could have had two plates of salad with that amount of dressing that he poured on. Perhaps Yogitree should consider letting their customers pour the salad dressing over their salad. It’s just a thought, though I know people tend to waste. Or better still perhaps the waiter should ask if we like more dressing and serve it to us. If you look closely you can see the dressing at the bottom of the plate. This is also probably the juiced from the roasted vegetables which consisted of carrots, squash and I believe it was Brinjal and topped with pinenuts. Crunchy, tasty and something different as it was a cooked salad of sorts. I like the combination of flavors. Rashid’s steak and chips I thought did look rather sparse on his square plate. Remove the bowl of gravy and the plate would look a trite empty. Even if they added two more wedges and, two more mushrooms cut into four and two or three more baby French beans would have certainly made a difference. The meat was small. Rashid ate everything up, except the vegetables which I gladly ate. We sat and chatted a while as the restaurant kept filling up, I must say it was a treat in itself to be here with Carol and Rashid. Yogitree is a nice place to hang out possibly during the Tai Tai times, when it would be less crowded and more relaxing. There is nothing worst then trying to eat healthy and rush through your food. I would go there again for sure with friends but it would probably be after 2 pm when things cool down. 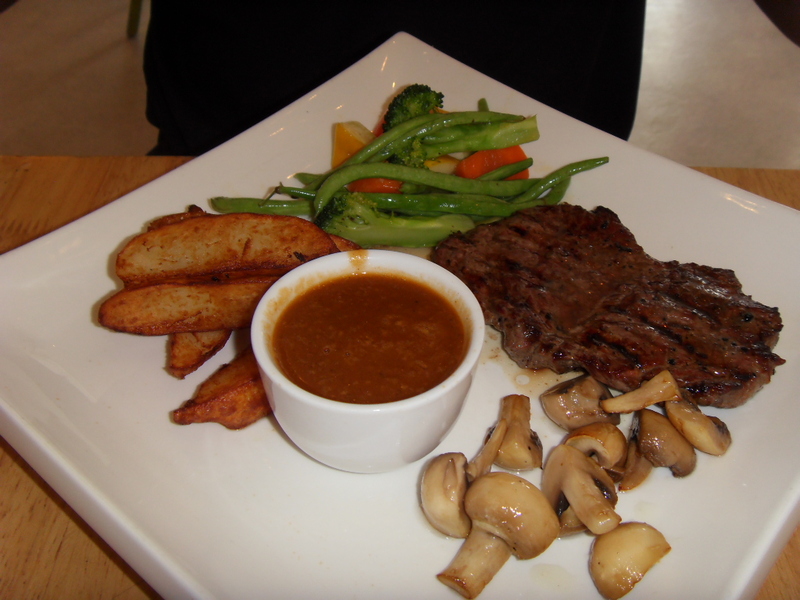 Service was good, staff are cordial and attentive, that is important in a good meal experience. Thank you Carol and Rashid for a wonderful lunch and excellent company.